There have been some positive reports coming out of the housing industry of later, including the growth in new home sales to close out 2010. However, as was pointed out in a previous post, these numbers weren't as great as some made them out to be. 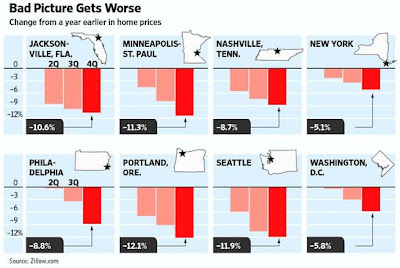 In fact, housing prices are still falling in most major markets, and the declines have only been picking up of late. In his blog post below, Tim Iacono of The Mess That Greenspan Made, talks more about the latest housing report published by The Wall Street Journal. The Wall Street Journal reports that the pace of U.S. home price declines is accelerating, their latest survey indicating prices fell in all of the 28 major metropolitan areas they cover. They also confirm other housing reports that show the inventory of unsold homes continuing to grow with more distress being seen in markets not previously thought of as major trouble spots such as Seattle and Portland. Of course, the inventory situation is not likely to improve anytime soon as the foreclosure pipeline continues to fill faster than it empties, a Wall Street Journal report last week revealing that the average time since borrowers in foreclosure last made a mortgage payment has risen to a whopping 492 days.